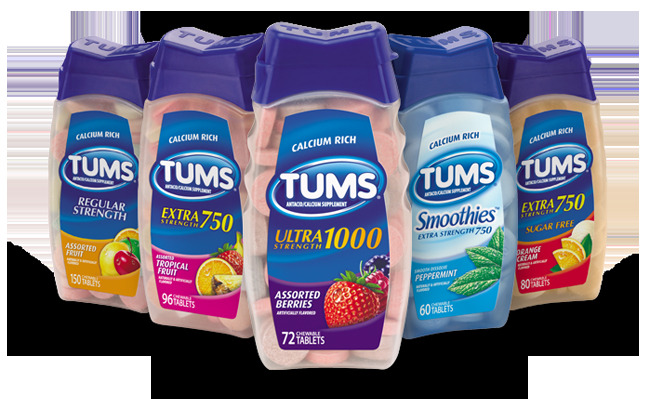 Tums is a brand of the over-the-counter supplement calcium carbonate. It is an antacid said to alleviate the symptoms of heartburn, such as an upset stomach or burning chest pains. It can also be used as a daily calcium supplement. Be sure to adhere to the instructions on the dosage labels. Too much calcium in your system can have very negative effects. It’s important to contact a doctor if you are experiencing any of the side effects of a calcium carbonate overdose, as it can mean a serious condition. An upset stomach is a very common side-effect. Too many Tums can irritate your digestive tract causing pain and discomfort. The irritation in the digestive tract can also cause nausea or vomiting. These stomach pains can also cause temporary loss of appetite. An overdose of calcium carbonate can have adverse effects on the digestive system. The effects can vary from person to person. In some cases, it will cause constipation accompanied by abdominal pain, cramping and bloating. For others, excess calcium carbonate will cause intestinal irritation which leads to diarrhea. If you experience severe or chronic constipation or diarrhea, serious medical complications such as dehydration and stool impaction can occur. The calcium carbonate in Tums can affect the way nerves in your brain transmit signals. If too many Tums are taken, mood swings and mental changes will occur. You may find yourself feeling confused, depressed or delirious. Seek a doctor’s advice immediately if you experience any mood swings after taking Tums. Calcium helps you regulate muscle contraction and relaxation when you engage in physical activity. Too much calcium carbonate in your system from a Tums overdose can mean that your muscles will not know when to contract or relax. This will result in muscle twitching and spasms as your body receives conflicting signals from the brain. Heart rate irregularities are also common side effects from eating too many Tums. If you’re experiencing these irregular heart rate changes when you eat Tums, consult your doctor immediately as it could mean a life-threatening heart condition. Some other side effects can include dry mouth, increased thirst or frequent urination. Dry mouth and increased thirst are signs of dehydration, so watch out for that and be sure to re-hydrate. Many people may also experience side effects such as unusual weight loss, headaches, bodily weakness, fatigue, bone and muscle pains. Warning: There is not a fully complete list of possible side effects from Tums. If you experience any side effects that are not listed in this article, consult a doctor or pharmacist. If you are in the U.S. you should call your doctor or general physician for medical advice about the side effects. You can also report any new side effects you’re experiencing to the FDA at 1-800-FDA-1088. If you’re in Canada, call your doctor for advice on side effects when taking tums. You can also report side effects to Health Canada by calling 1-866-234-2345. If you experience excess urination, quit using Tums immediately and contact your doctor if it persists. Serious allergic reactions to Tums is very rare. However, if you experience rashes, itching and swelling, severe dizziness or any trouble breathing you need to contact a doctor as this could be a sign of allergic reaction to calcium carbonate. If any side effects persist or worsen over a period of time, seek medical attention immediately. Some symptoms will simply go away once you stop taking Tums. If symptoms don’t improve once you stop taking Tums, it could mean that you are suffering from a more serious condition. Follow any and all directions listed on the packaging and be sure to have a look at the ingredients and supplement content. For daily doses over 600 milligrams, you can divide your dose and take it throughout the day for optimum absorption. If you’ve been ordered by a doctor to follow a special diet and Tums regimen, be sure to follow it. Do not add other supplements into the mix unless instructed by your doctor. Chewable tablets. If you’re using chewable tablets be sure that you chew them well before swallowing. Effervescent tablets. For the tablets that dissolve in water, be sure the tablet has fully dissolved before you drink the glass of water. These effervescent tablets are not meant to be chewed or swallowed whole. Liquid or powder products must be properly measured using a dose-measuring spoon. For liquid products, be sure to shake the bottles well before each dose. Is It Safe to Take Excess Biotin?